Hack, slash, loot and level eternally in the Emperor's name. 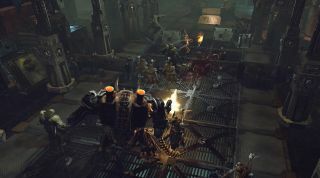 Neocore's Warhammer 40,000: Inquisitor - Martyr may have some dents in its armour, but it's hard to deny that it captured the look, sound and atmosphere of Games Workshop's gothic-fantasy universe. Still, it fell a little short of what some people look for in an action RPG. This week's Warzone update goes some way to address that, but not without issue. Warzone is Inquisitor's endgame, at least for now. Once you're done with the main story (and after hitting a power rating of at least 1100) you can dive into a new 5-chapter story in the Lacaon system. Each of these chapters contains ten battles to get through, and once all fifty have been conquered you'll unlock additional endless, randomly generated battles. While Warzone is a hefty time investment and provides something for players to do after the main story, player responses to it on developer Neocore's own site and on the Steam forums have been mixed. Many seem to find the current Warzone missions monotonous. The only objective is Purge (clear the area entirely) in very similar environments, with the only real difference between battles being enemy placement and escalating difficulty. In one final bizarre twist, the final boss at the end of the Warzone—The Nemesis—is yet to be added to the game, and should be arriving in the next major update. While the staggered releases are an odd decision, Neocore do have big plans for the game, with promises of a second season of content (as detailed on the Steam forums here) planned featuring the Dark Eldar (evil space-elves), a raised level cap, new loot and new missions. In the grim darkness of the 41st millennium there may only be war, but the galaxy is a big place, and it would be nice to mix the scenery up a little, if nothing else.